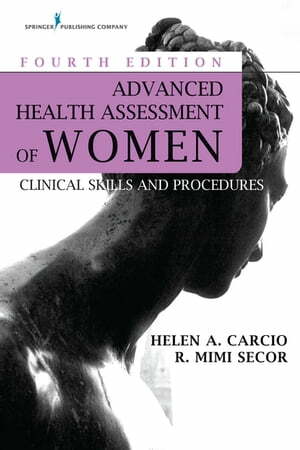 Collins Booksellers - Advanced Health Assessment of Women, Fourth Edition by Helen Carcio, MS, MEd, ANP-BC & R. Mimi Secor, DNP, FNP-BC, NCMP, FAANP, 9780826124623. Buy this book online. Written for nurse practitioners, physician assistants, nurse midwives, and other primary care providers, this new edition of Advanced Health Assessment of Women, continues to deliver the clinical skills required to care for the unique healthcare needs of women. This text delves into the growing role of the advanced practice clinician, establishing a foundation for and an understanding of the rationale behind the techniques and procedures described. Master’s level and doctoral level curricula provide basic content for the advanced practice clinician but may not provide sufficient education and training regarding advanced women’s health skills and procedures. This practical manual is designed to fill that gap, linking theory to clinical practice using critical thinking. Using a clear and concise outline format, Advanced Health Assessment of Women avoids unnecessary jargon and cuts straight to the clinical skills, techniques, and procedures the advanced practice provider needs to know. Content progresses from simple to complex, covering basic assessment and physiology, health history, physical examination, and specific investigative procedures. Each technique and procedure outlined contains detailed descriptions, strategies for patient preparation, and recommended follow up, accompanied by a comprehensive list of equipment. In this new edition, all content has been reviewed and expanded to reflect the most updated evidence-based clinical practice guidelines.